On March 4 we reviewed the technical reasons why the gold sector was launching as opposed to blowing off. This, after articles began appearing calling the rise to that point a doomed parabolic blow off using daily charts. Those calling it a blow off were confused; silver in spring 2011 was a blow off in the terminal sense. But when a parabolic move comes off a bottom, it is an impulsive thrust to change the trend, possibly ending the bear market. We have long noted that gold is the first mover to a new inflationary phase, as the previous deflationary backdrop gets played out. That is exactly what happened, even though the silver miners have made stunning strides in leading the exciting up move in silver that is currently in process. Silver, in taking over leadership from gold would confirm an inflationary phase. Gold is monetary and silver is an industrial commodity with monetary aspects as well; i.e. it is more positively correlated to inflated economies making the silver-gold ratio a sensitive indicator to inflation. Now, with silver getting out of the barn we see energy, base metals and emerging markets also hoofing it into the light of a potential new inflationary phase, AKA a new 'inflation bull' market. Oh and let's not forget the chickens... they are coming home to roost, right at the Fed's doorstep (conveniently, right into next week's FOMC meeting). Here again is the weekly silver chart, taking out its bear market limiter (EMA 55) and the silver-gold ratio, dealing with its limiter (EMA 80). These were noted in yesterday's post. Silver vs. gold is and has been our primary barometer on such a phase. Below is the silver miners ETF vs. gold miners ETF. Before getting overly excited, note that what has happened to this point has been a move for the SIL-GDX ratio to simply bounce back to trend, which remains down on the weekly view. The black arrow represents what is still a lower high. Can that change? In a heartbeat. Has it changed as of this writing? Nope. 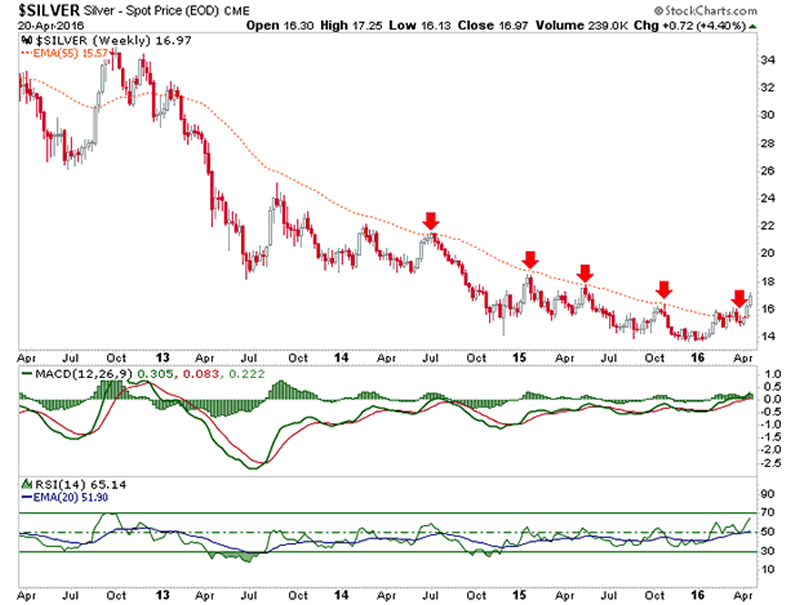 We have noted that silver has broken its bear trend by rising well above the weekly EMA 55 and that the silver-gold ratio is dealing constructively with the weekly EMA 80 that contained it throughout the cyclical bear market. A few days ago we also noted that silver is and has been in a secular bull market. However, with the silver-gold ratio rising we see a world of other items climbing out of the depths of deflationary despair; from the aforementioned energy, base metals and emerging markets to developed markets and stock sectors all dependent upon a risk 'on' atmosphere, which is another signal of a rising silver-gold ratio. Inflation is promoted to keep asset prices aloft (with a side benefit of allowing governments to inflate away portions of their debt, which is otherwise unmanageable). For months now we have speculated in NFTRH that a new inflation phase is in the offing (after the first mover, gold, rises amid global economic contraction) and the thrust off the bottom in the precious metals complex and now the rest of the commodity pack, indicates it is here. However, a mini blow off within the launch phase in silver is happening right now and this will eventually bring a reaction (momentum will blow out when it blows out, which is how blow offs work), which is not likely to be a gentle sideways consolidation. What is happening now is like a microcosm of spring 2011, only a coming correction would very likely not be terminal. Its job will be to confirm a new 'inflation bull' market. Watch the precious metals as always, for the early clues.